West Windsor, N.J. - A family classic takes center stage to usher in the holiday season at Mercer County Community College's Kelsey Theatre. The James Tolin Memorial Fund is proud to present the Joe Landry adaptation of Frank Capra's "It's a Wonderful Life: A Staged Radio Play" on Friday, Dec. 3 at 7:30 p.m.; Saturday, Dec. 4 at 2 p.m. and 7:30 p.m.; and Sunday, Dec. 5 at 2 p.m. Kelsey Theatre is located on the college's West Windsor campus, 1200 Old Trenton Road. The production is directed by Brian A. Bara of Levittown, PA, and features Jennifer Barron of Hamilton; Glenn Calhoun of Robbinsville; Damian Gaeta of Hamilton; Sean McGrath of Churchville, PA; John Maurer of Ewing, and Sarah Stryker of Lawrenceville, all taking on multiple roles. 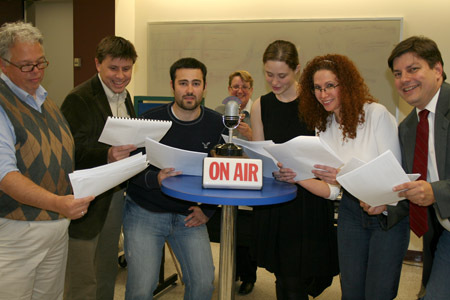 The production recreates the experience of seeing a live radio broadcast from the 1940's just as a studio audience would have, complete with a live Foley (sound effects) crew. Cast and crew include, from left, Sean McGrath, Glenn Calhoun, Damian Gaeta, Judi Parrish (background), Sarah Stryker, Jennifer Baron and John Maurer. Actors will be featured in multiple roles; Parrish is the show's Foley Artist. The radio play of "It's a Wonderful Life" was developed from Landry's full stage production and was first mounted at the Stamford Center for the Arts in 1996. It tells the story of George Bailey, a man about to take his own life who is pulled from the brink by Clarence, an angel-in-training. Clarence shows George how different -- and overwhelmingly unhappy -- the lives of his family and friends would have been had he never been born. The beloved 1946 Capra film stars James Stewart, Donna Reed and Lionel Barrymore. It also served as the inspiration for the names of the "Sesame Street" characters, Bert and Ernie. Tickets are $14 for adults, $12 for seniors, and $10 for students/children. Free parking is available next to the theater. Tickets may be purchased online or by calling the Kelsey Box Office at 609-570-3333. Kelsey Theatre is wheelchair accessible. For more information about The James Tolin Memorial Fund, click here or search "James Tolin Memorial Fund" on YouTube.